NOTE: Date must be in the form YYYY-MM-DD, like 2019-02-05. HARRODSBURG, Ky. - Paul Hilpp, co-owner/operator of Hilpp Construction, a 2011 Campbellsville alumnus and Lebanon native, has pledged a gift of $250,000 to the Harrodsburg Conover Education Center of Campbellsville University. Hilpp designated the pledge as a $100,000 in cash contributions for student scholarships and $150,000 for capital projects toward the continued expansion of the Harrodsburg Conover Education Center. 2019-02-05 - Columbia, KY - Photo courtesy Stotts-Phelps-McQueary Funeral Home. I don't believe that was Cotton Durham - first he had hair, second he was wearing a tie (ugly). When he was in the legislature as a member of the House of Representatives, someone broke into his car and stole his suit. Laughing, he said, "boy will that thief be surprised or quickly identified as a 5-9 bald headed heavy weight." Deputy Brandon Hitch received a call that a 90's model Chevrolet S-10 was traveling toward Columbia on South 55, allegedly firing shots from the window of the vehicle. Deputy Hitch met a vehicle matching this description and attempted to initiate a stop. The vehicle continued a short distance and pulled up to a barn at a private residence. Two male occupants fled on foot and a foot pursuit ensued. With a quick response from multiple KSP troopers and CPD officers, both men where apprehended. He and his wife Connie are the owners of Stotts Construction Company, Inc. He is a Kentucky Colonel and was very active in the Adair County community and Kentucky Politics. He was a very active member of the Kellyville Community Church and loved serving his church and savior. 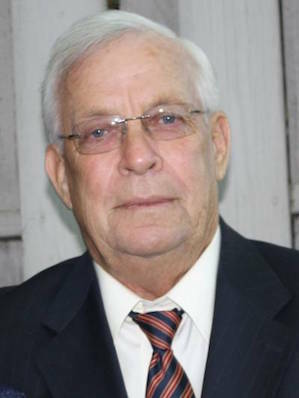 Porter "Junior" Stotts, 70, of Columbia died Monday, February 4, 2019 at the St. Thomas Midtown Hospital in Nashville, TN. Funeral services will be 11amCT on Saturday, February 9, 2019, at the Kellyville Community Church, 77 Kellyville Rd., Columbia, KY, with burial to follow in the Fudge Cemetery at Breeding, KY.
Bro. Stanley Watson, Bro. Bobby Withers and Bro. John Campbell will be officiating and pallbearers will be Dan Lawhorn, Doug Melton, Junior Smith, Billy Crew, Jimmy Branham, and John Speer. Visitation will be on Friday, February 8, 2019, from 1pmCT until 8pmCT at the Stotts-Phelps-McQueary Funeral Home, 210 Greensburg St., Columbia, KY, and then on Saturday from 9amCT until 11amCT at the Kellyville Community Church. Authorities believe two bodies found inside a burning car in West Tennessee could be from Kentucky. The remains of two people, believed to be a man in his 20s and a woman in her 30s, were found Saturday morning in a silver Ford Edge in Dyersburg, Tennessee, according to the Tennessee Bureau of Investigation. Agents say the SUV was a rental vehicle from Campbellsville, Kentucky, and they believe the two people are likely from the area, the bureau said in a news release. Campbellsville University students took part in the Greater Campbellsville United Diversity Festival on Saturday, January 26, 2019, at the Taylor County Extension Office. Since 2003, Greater Campbellsville United has hosted a diversity festival each year in order to showcase diversity within the community. This year they partnered with the extension office to host their 16 annual Diversity Festival with the theme of "Diversity in Action." After reading the caption under the Town Square drawing by Patty Sandusky with Cotton Durham in it drinking a Coke, I was reminded of another photo that he was almost in! Back in the good old days of J D Harper's Circle R, where a lot of serious talking took place and history would come up often, Cotton told of a turkey drive he helped on that was going to drive 300 turkeys to market. Well as things would usually go, everyone there got on his case about this turkey drive he helped on. A few days later, Cotton brought in a photo of all the turkeys when they were in Cane Valley, and proceeded to prove his point of being in on the turkey drive. After everyone had looked at the photo, one wise-a** asked Cotton where he was in the photo. Without any time wasted, Cotton told them "that was him, just out of the picture on the left!" Thomas Hardison of Adair County was airlifted from the scene after a collision on KY 61 North. On Monday, February 4, 2019, at 5:32pmCT, Adair County 911 dispatched Deputy Josh Durbin of the Adair County Sheriff's Office to an auto collision involving a motorcycle. Preliminary investigation shows that Marilynn Blair, 64, of Taylor County, was traveling south on KY61 at a high rate of speed. Blair topped a rise and struck a 2006 Honda motorcycle in the rear. The bike was operated by 70 year old Thomas Hardison of Columbia. The impact sent the motorcycle 301 feet from the point of impact before coming to rest. Hardison was found in the roadway, 215 feet from the impact. Walter Earl Walters of Somerset (formerly of Russell County, Kentucky) died Monday, February 4, 2019 at the Lake Cumberland Regional Hospital in Somerset. He was 76 years old. Funeral service for Walter Earl Walters will be 11amCT on Friday, February 8, 2019, at the Bernard Funeral Home Chapel, 367 N. Main St., Russell Springs, KY. Burial will follow in the Holt Cemetery. Visitation is requested after 9amCT on Friday at the funeral home. He was a Chef and a member of the Greens Chapel Baptist Church in Jamestown, KY.
Brent A. Garr, 59, of Burkesville, KY, formerly of Jamestown, KY, passed away on Saturday, February 2, 2019, at the Medical Center in Bowling Green, KY.
Funeral Services for Brent Garr will be held at H.E. Pruitt Memory Chapel, 202 N. Main St., Jamestown, KY, on Wednesday, February 6, 2019, at 1pmCT, with Rev. Albert Taylor, Jr officiating. Burial will follow in the Greens Chapel Cemetery, Jamestown, KY.
Friends may visit on Wednesday after 11amCT at the funeral home. The Lindsey Wilson wrestling team hosts No. 5 Cumberlands (KY) for senior night on Tuesday at 7pmCT at Biggers Sports Center, 360 Spickard Drive, Columbia, KY. Seven senior student-athletes are being honored in tonight's ceremony for their contributions to the Lindsey Wilson wrestling program. Brett Bradford, Jacob Burroughs, Trevor Edmonson, Bryson Jones, Lucas Miozza, Brady Moser and Mark Taijeron will all be honored. On Friday, February 1, 2019, at approximately 7:30amCT, Chief Deputy Justin Cross and Sheriff Brockman conducted a traffic stop on a 2010 Ford Mustang in the limits of Columbia. As a result of the stop, 40-year-old Larry Bryant of Casey County was arrested on charges of Operating a Motor Vehicle on Suspended License, Possession of Drug Paraphernalia, and Possession of Controlled Substance Methamphetamine. Mammoth Cave National Park was closed for five full weeks during the partial federal government shutdown, and the economic consequences were significant. Mammoth Cave officials estimate a $132,000 direct revenue loss from not being able to provide the cave tours that had been reserved between Dec. 22 and Jan. 25. The park will not be able to recoup the lost money. The Adair County Volunteer Fire Department responded to a residential house fire at 520 Portland Road, Columbia, KY on Tuesday morning at 2:56amCT. 18 firemen were on the scene for about 2 hours. The home, owned by Lisa Crawhorn, was a total loss. Students from the Adair County Primary Center's STLP wanted to make an impact in their world. They have created and produced a video about internet safety entitled "Technology is Everywhere: Let's Be Safe." The video is about 10 minutes long. The students want their video to be seen and shared. When you watch the video, please leave us a comment and tell us where you are from either through email (laura.marcum@adair.kyschools.us) or on the video's YouTube page. Frankfort, KY - As Valentine's Day approaches, Attorney General Andy Beshear is warning Kentuckians to be wary of online dating scams that have already caused four victims in Campbell, Jefferson and Wayne counties to report losses of nearly $300,000 this year. In each case, a "sweetheart scammer" used legitimate online dating websites Match.com and eHarmony to lure victims into a fake online relationship. It's currently 57F at the Adair County Mesonet Station. There's a chance of patchy fog this morning before 8amCT. Expect cloudy skies, with a high near 66F, and isolated showers and thunderstorms before 2pmCT, with more isolated showers and thunderstorms again after 5pmCT. Calm wind becoming south around 6 mph in the afternoon. The chance of precipitation is 20%. The chance of showers and thunderstorms increases overnight, with a low around 58F and southeast wind 3 to 8 mph. The chance of precipitation overnight is 80%. Wednesday will bring more showers and possibly a thunderstorm, with an expected high near 70F, and southwest wind 8 to 13 mph. The chance of precipitation on Wednesday is 90%. New rainfall amounts between a half and three quarters of an inch are possible. Casey County: No events Circuit Court. 27 events District Court. Green County: 1 event Circuit Court. No events District Court. Taylor County: 223 events Circuit Court. No events District Court. and smile while in pain. --Robert Stone, Tuesday, 5 February 2019. Adair County Judge Executive Gale Cowan and Columbia Mayor Pam Hoots will be guest speakers at the February Chamber of Commerce Meeting Tuesday, February 12, 2019. The meeting begins at 11:45amCT at the Cranmer Dining Center on the campus of Lindsey Wilson College. On January 24, the Lake Cumberland Area Development District's (LCADD) Board of Directors held its first meeting of 2019 at the district's office in Russell Springs. The full board is automatically comprised of all judge-executives and mayors from Adair, Casey, Clinton, Cumberland, Green, McCreary, Pulaski, Russell, Taylor and Wayne counties. In addition, 20 citizens from all 10 counties serve on the Board.